Leading Manufacturer of Ammonium Bicarbonate, Ammonium Chloride, Bleaching Earth, Potassium Carbonate, Sodium Bisulphite and Sodium Formaldehayo Sulphoxylate from Jodhpur. 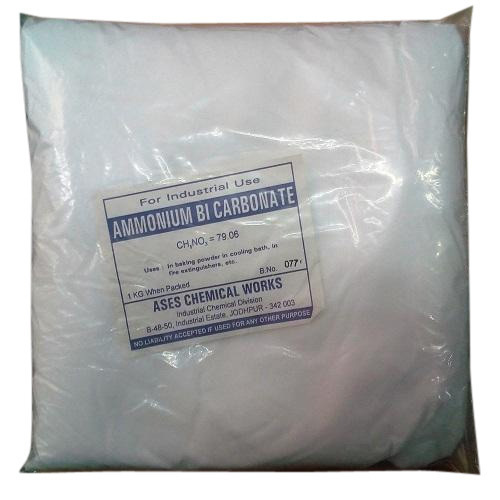 Backed by years of industry experience, we are engaged in offering a premium quality range of Ammonium Bicarbonate. No Liability Accepted if used for any Other Purpose. We are successfully meeting the varied requirements of our clients by providing the best quality range of Ammonium Chloride. Backed by rich industry experience and market understanding, we are involved in offering a wide array of Bleaching Earth to our valued patrons. Aimed at a prosperous growth in this domain, we are engaged in offering an excellent quality range of Sodium Thiosulphate. With our years of experience & in-depth knowledge in this field, we are engaged in offering a quality-assured array of Stearic Acid. Riding on unfathomable volumes of industrial expertise, we are providing a broad array of Borax Powder. We are among the reputed organizations, deeply engaged in offering an optimum quality range of Titanium Dioxide. Being a leading firm in this industry, we are deeply engaged in offering a high-quality range of Trisodium Phosphate. With the valuable assistance of skilled team of professionals, we are engaged in offering an extensive range of high-quality Zinc Oxide.